Fourteen-year-old Nahomi Estrella (center) came from New York City for the free MetroHacks event in Cambridge. CAMBRIDGE — Ashrafe Anom Nudia opened a giant Dell laptop with a screen that nearly shielded her entire face. She pulled up the MIT App Inventor website, shook her head, and giggled into her bright blue hijab. Like the other hundred girls that filled the Cambridge Innovation Center on Saturday, Nudia was there to learn, code, and hack, which involves using computer code to run a program, develop an application, or provide a quick solution. “It’s not something that everyone knows how to do,” said Nudia, a 10th-grade student from Flushing International High School in Queens, N.Y. “But when I grow up, I want to be a hacker” — for the New York Police Department, she added. 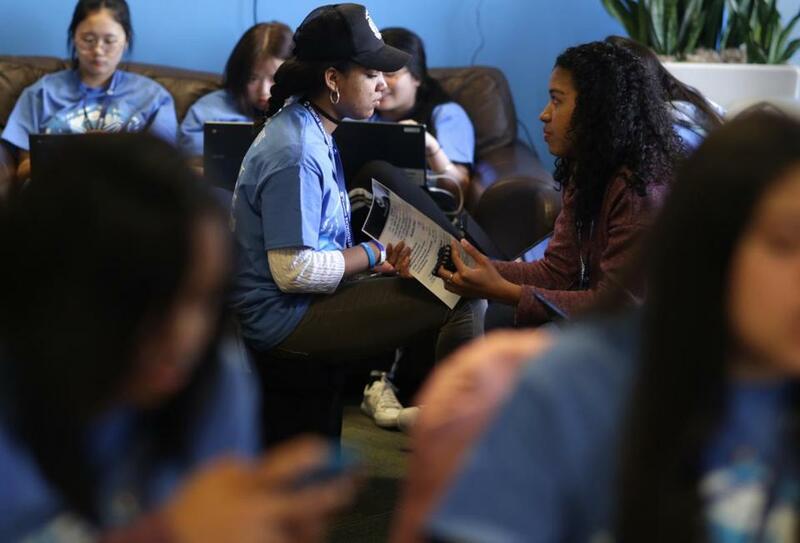 The free, girls-only event was put on by MetroHacks, a Boston-based organization run by high school students. Attendees from cities such as New York and Providence, and even an entire high school class from Chicago’s western suburbs, gathered here to learn from specialized workshops, network with other young coders, and compete in the hacking competition for a slew of tech-related prizes. MetroHacks brings a collegiate-style hackathon to high school students of all backgrounds who are motivated to learn and think creatively. The group is famous for its annual 24-hour coed event in May, billed as the largest high school hackathon in New England. Almost every seat in the shared workspace was filled with girls clacking away on sticker-adorned laptops, checking their Slack notifications, and swapping ideas in a dozen different coding languages. They stocked up on snacks and flavored water for fuel to last through the 12-hour event. Kirsten Fournier watched the girls work from a high-top table in the space. Fournier is a Hopkinton High School teacher and self-taught coder, who served alongside a few adults as an event mentor. She teaches entry-level coding classes in addition to robotics, game design, and advanced placement computer science. While Fournier watched over the larger room of girls, Vinisha Dhuleshia, 17, of Shrewsbury, and Siobhan Gannon, 18, of Hudson, made their way to a soundproofed “huddle pod,” where they could draw up plans on the walls and brainstorm in private. The walls were covered in neon marker, including the girls’ plan, deadline, and goals by the hour. The teens have been making a name for themselves as coders for years now. The Advanced Math And Science Academy Charter School students know languages such as Java, C, and Python, and have won awards for their app-building work. The two developed an app called “RingAlert,” which would use hardware and software features to call police for women in dangerous situations. The hardware portion of the app would include smart jewelry such as earrings or rings. If a person twisted the jewelry three times, it could be triggered to enable location services on a woman’s phone and call 911 if need be. The girls included a “safe word” feature to make sure no one accidentally called police, and were careful to design a subdued logo and interface in an effort to avoid attention while using the app. Samantha J. Gross can be reached at samantha.gross@ globe.com. Follow her on Twitter@samanthajgross.